French Quarter was composed for the Perimeter Flutes for the 2013 National Flute Association Convention in New Orleans, Louisiana. 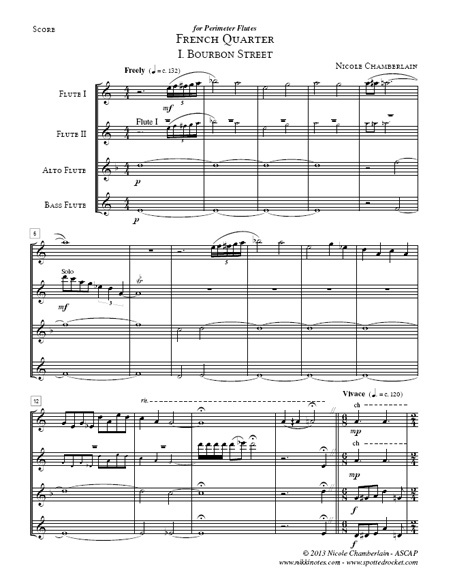 This piece is based on four historic icons of the French Quarter in New Orleans that are steeped in musical tradition the composer encountered on a vacation that took place over the New Year's holiday. The piece kicks off as the composer first encounters the French Quarter's Bourbon Street. As she approaches the street she could hear and see the hustle and bustle of the New Year's Eve partying in full swing and was soon swept up in the crowd. Next, she spends a cold January morning swirled in the powdered sugar blowing in the cold wind from Cafe du Monde which is serving beignets to the New Orleans natives and tourists. Then she overhears the jazz and blues traditions in Preservation Hall that spills out into the streets of New Orleans. Lastly, the way to exit the French Quarter is by the St. Louis Cemetery. We hear a jazz funeral procession followed by an uplifting celebration of life and reluctantly leave the French Quarter. Premiered at the 2013 National Flute Association Convention in New Orleans by Perimeter Flutes!